Biosphere Expeditions, the international award-winning non-profit conservation organisation, has just finished its sixth annual survey expedition in the wildlife haven of the Dubai Desert Conservation Reserve (DDCR). Seventeen citizen scientists and conservation professionals from nine nations in Europe, Africa, North America and the Middle East joined forces to survey the biodiversity of the sand dunes not far from the glittering metropolis of Dubai. Together they counted 31 bird, 11 mammal & reptile, 11 insect and 15 plant species. Amongst them 104 Arabian oryx, 77 Arabian gazelle, 4 sand gazelle, 140 palm trees, 843 ghaf trees, 28 acacia, 12 Sodom’s apples and a whopping 8,000 or so broom bushes. The United Arab Emirates, and Dubai in particular, are well known for its rapid development over the past 50 years as well as for mega-construction projects such as the Palm Islands and the Burj Khalifa (the world’s tallest building). Less well known is the diversity and beauty of the natural environment, from the dugongs and corals in the Arabian Sea to the serene splendour of the sandy dune inland desert. Also little known is that the largest piece of land given to any single project in Dubai was for the establishment of the DDCR in 200; at 225 km², 4.7% of Dubai’s total land area, and the expedition’s study site. The Arabian oryx is the largest of the antelopes in the region and it is very well adapted to the extremely arid environment. Oryx once roamed all across Arabia, but the advent of firearms saw their rapid decline. The Arabian oryx is classified as “Endangered” on the IUCN Red List. Re-introduced into the DDCR in 1999, the population has steadily grown from the original 100 individuals to over 400 today. For the next phase of the oryx project, local scientists need a greater understanding of how oryx fit into the DDCR’s natural environment, which habitats and plants they prefer, what the social structure of the herd is and how this is affected by the environment. 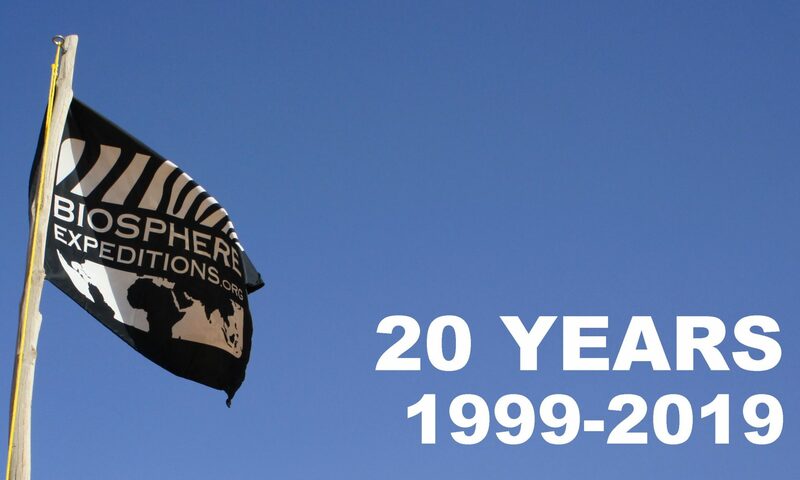 “This can only be achieved through monitoring, for which Biosphere Expeditions provides the manpower”, says Simkins. Other species seen by the expedition included a very rare Gordon’s wildcat, as well as Arabian hares and Macqueen’s bustards. There was also an exciting sighting of four short-eared owls, a first for the DDCR. The expedition also surveyed vegetation such as the beautiful ghaf tree. 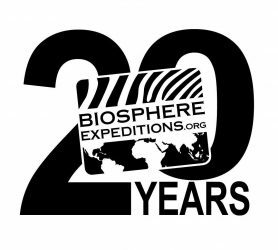 A journalist from National Geographic also took part in the expedition, as well as an assessor from the World Tourism Council, as Biosphere Expeditions has been shortlisted for the very prestigious “Tourism for Tomorrow” Award. The 2017 expedition was kindly supported by Al Maha Desert Resort & Spa, as well as Platinum Heritage Luxury Tours & Safaris. The next annual expedition will run from 20 – 27 January 2018 and “anyone is welcome to join”, says Dr. Hammer. “The more citizen scientist we have helping us, the more we can achieve”, concludes Simkins. More information about the expedition can be found on www.biosphere-expeditions.org/arabia.